It is feature time once again. I thank everyone for linking up and sharing our of you wonderful recipes, crafts and tips. We have a birthday coming up in a few days in our house, so this week I chose my features based on things you can make for a party. 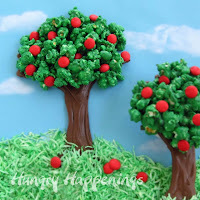 Chocolate Popcorn Trees. Such a fun treat to celebrate the earth. 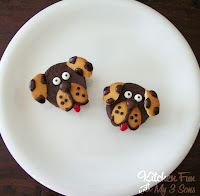 I also adore Kitchen Fun with My 3 Sons Ding Dong Doggies. We had planned on throwing a party for our 3 cats over spring break who have all had a birthday in the last month. We did not end up having one because of time, but if we do maybe we will make a ding dong kitty. I really like making cookies with Nutter Butters, but have never even thought of turning them into ballet slippers. Phaedra's Adventure had such a cute idea with her ballet slipper cookies that would be great for a little girl party. Kara the Craft Diva was so excited to see Angie's Whim and her hedgehog pincushions.. Kara is a bit obsessed with hedgehogs, and has been begging for one for some time. 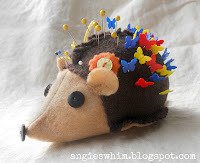 She is also a huge Sonic fan, so I was not surprised at all when chose a hedgehog craft as her feature of the week. Thank you to everyone who linked up. If you have been featured you are welcome to use either the Pams Party Blog or the Dare to Share button on the right side of the blog. I hope to have a new feature button shortly.